Ever since Katie was first diagnosed with Cystic Fibrosis two years ago, the love and support of our family and friends has been phenomenal. We have been extremely grateful to everyone that has offered prayers, words of encouragement, friendship and support as we adjusted to living life with a fatal disease always lurking in the background. On the last Sunday of May each year, the Canadian Cystic Fibrosis Foundation hosts the annual “Great Strides™: Taking Steps to Cure Cystic Fibrosis” walk. This past May was our second year attending the walk. It was a greet day – the weather was perfect, we had a great turnout and we had a lot of fun. Check out this post for all of the details from the day. 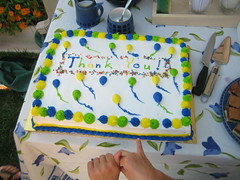 This year, Team Katie had 210 sponsors and 53 people walked with us at Safari Niagara on Sunday May 30 2010. Team Katie raised over $13,000! Check out the Team Katie – Great Strides 2010 Results! blog post for a full summary of what the team accomplished this year. To say thank you and to celebrate the success of this year’s walk, we hosted a thank you party for everyone that walked with us this year. The party was held at our house on Sunday August 29. You can see pictures from the event at this flickr slideshow. We would like to say thank you to everyone that walked with us, donated to this year’s Great Strides walk and/or offered encouragement to us this year. We are truly grateful for the generosity that everyone has shown.